In this workshop, we will tap into the insightful use of numerology (using our date of birth) as a way to determine where we have challenges and weaknesses as well as gifts and strengths in our lives. With this knowledge, we can see a clear and useful picture of ourselves and know very practically how we can grow. We can then use specific yoga exercises to become well-rounded, balanced, harmonious in relationships, connected to our spiritual self, and feeling satisfied and fulfilled on our life’s path. We will spend time going over the formula which gives each person their numerology chart, including the 3 areas of challenge and the 2 areas of strength. 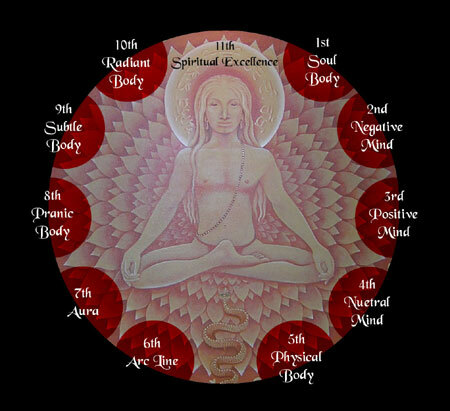 This relates to 10 bodies we have: our physical body, the 4 subtle inner bodies and the 5 outer ‘light’ bodies. When we have this view of ourselves, we can approach our obstacles with clarity and confidence and utilize our gifts to their utmost potential. We will then practice a yoga set to energize and strengthen these 10 bodies, as well as work with a powerful mantra to help us master all parts of ourselves. This knowledge can be taken with you so you can have fun doing numerology charts for your friends and family, which will also shed light on yourself and your practice. If you would like to go more in depth and are interested in a personal reading, you can receive one via email for an additional fee.